Simply beautiful, my friend. Sending you a hug and warm thoughts. Nik’s smile is so infectious. So genuine. I can’t help but smile myself when I see his happiness! I completely understand what you’re saying. I love the one of Nik and his daddy… of course I am partial to boys and their daddies. 😉 Many hugs to you…..
Niksmom. Your pictures are simply beautiful. But you are mistaken, if you don’t mind my saying so. You have many, many MORE anchors. You have all of these fellow bloggers logging in every day, laughing and crying with you – loving you and your boy every single day. Mothers. We are a powerful gang. Very sweet. Chronic pain is so hard on everyone. I am praying for Nik. Hugs. Aw, lookit little Nik and the taco! He is all, “My taco! Okay, now how do I approach this? Hmmm…requires practice.” His warm-up bites bring a big smile to my face. What a brave little man! That smile is just beautiful. Hang in there. 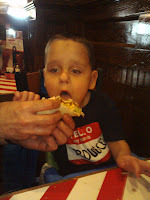 Isn’t there something so unbelievably satisfying about seeing your son enjoying food? Especially when food/feeding is a big issue.